Kedah also known by its honorific, Darul Aman, or "Abode of Peace" is a state of Malaysia, located in the northwestern part of Peninsular Malaysia. The state covers a total area of over 9,000 km², and it consists of the mainland and Langkawi. The mainland has a relatively flat terrain, which is used to grow rice. Langkawi is an archipelago of islands, most of which are uninhabited. Kedah was called Kadaram (Tamil:காடாரம்) by ancient and medieval Tamil people and Syburi (Thai: ไทรบุรี; Sai Buri) by the Siamese when it was under their influence. To the north, Kedah borders the state of Perlis and shares an international boundary with the Songkhla and Yala provinces of Thailand. 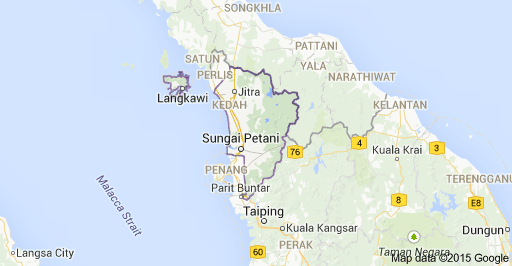 It borders the states of Perak to the south and Penang to the southwest. The state's capital is Alor Setar and the royal seat is in Anak Bukit. Other major towns include Sungai Petani, and Kulim on the mainland, and Kuah on Langkawi. As of 2010 the population of Kedah is 77.2% Muslim, 14.2% Buddhist, 6.7% Hindu, 0.8% Christian, 0.3% Taoist or Chinese religion follower, 0.7% follower of other religions, and 0.1% non-religious.